Tōdai-ji (東大寺, Tōdai-ji), meaning the Eastern Great Temple, is a Buddhist temple complex located in the city of Nara, Japan. Its Great Buddha Hall (大仏殿 Daibutsuden), reputedly the largest wooden building in the world, houses a colossal bronze statue of the Buddha Vairocana, known in Japanese as the Daibutsu (大仏). 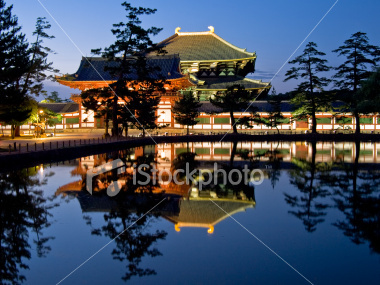 Illuminated evening view of the inner gate and wall surrounding Todaiji Temple with a pond in the foreground in Nara, Japan. Todaiji Temple can be seen in the background behind the wall. Frontal view of the inner gate and wall surrounding Todaiji Temple with reflections in the pond in the foreground in Nara, Japan. Todaiji Temple can be seen in the background behind the wall.